Nokia Lumia 1020 Guerilla Launch - We Are Fearless | Boldness with backup. 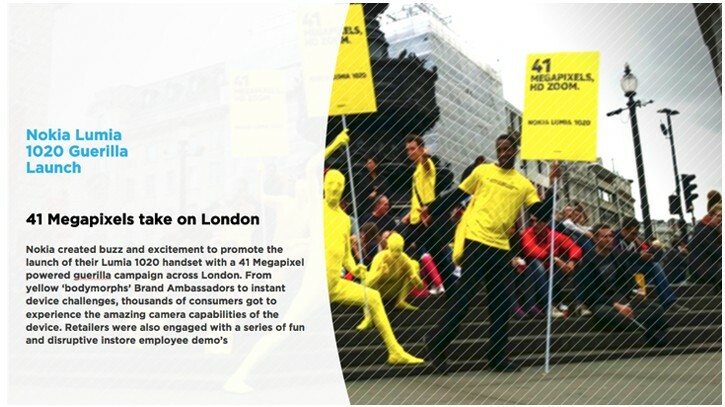 Nokia created buzz and excitement to promote the launch of their Lumia 1020 handset with a 41 Megapixel powered guerilla campaign across London. From yellow ‘bodymorphs’ Brand Ambassadors to instant device challenges, thousands of consumers got to experience the amazing camera capabilities of the device. Retailers were also engaged with a series of fun and disruptive instore employee demos.